Background: With respect to the increase in the average life expectancy, Alzheimer Disease (AD), the most common form of age-related dementia, has become a major threat to the population over the age of 65 during the past several decades. The majority of AD treatments are focused on cholinergic and amyloid hypotheses. 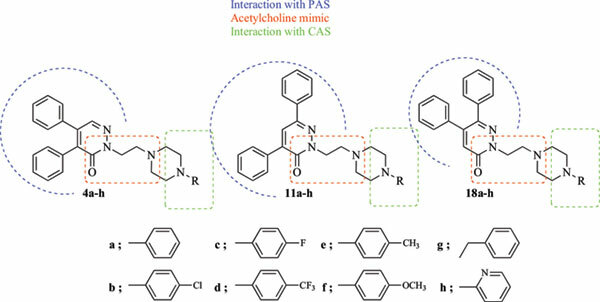 Objective: In this study, three series of diphenyl-2-(2-(4-substitutedpiperazin-1-yl)ethyl)pyridazin- 3(2H)-one derivatives were designed, synthesized and investigated for their ability to inhibit both cholinesterase enzymes and amyloid-β aggregation. Method: The inhibitory activities of the synthesized compounds on AChE (from electric eel) and BChE (from equine serum) were determined by the modified Ellman’s method. The reported thioflavin T-based fluorometric assay was performed to investigate the effect of the selected compounds on the aggregation of Aβ1-42. The cytotoxic effect of the compounds (4g, 11g and 18g) was monitored in 3T3 cell lines to gain insight into therapeutic potential of the compounds by using MTT assay. The crystal structures of the AChE (1EVE) and BChE (1P0I) enzymes were retrieved from the RCSB Protein Data Bank and Molecular Operating Environment (MOE) software was used for molecular docking of the ligands. Results: Among the tested compounds, 5,6-diphenyl derivative 18g was identified as the most potent and selective AChE inhibitor (IC50 = 1.75 µM, Selectivity Index for AChE > 22.857). 4,6- Diphenyl derivative 11g showed the highest and the most selectivity for BChE (IC50= 4.97 µM, SI for AChE < 0.124). Interestingly, 4,5-diphenyl derivative 4g presented dual cholinesterase inhibition (AChE IC50= 5.11 µM; BChE IC50= 14.16 µM, SI for AChE = 2.771). Conclusion: Based on biological activity results and low toxicity of the compounds, it can be said that diphenyl substituted pyridazinone core is a valuable scaffold. Especially, dual inhibitory potencies of 4,5-diphenylpyridazin-3(2H)-one core for the cholinesterase enzymes and Aβ- aggregation makes this core a promising disease-modifying agent. Alzheimer's disease, pyridazinone, acetylcholinesterase inhibitory activity, butyrylcholinesterase inhibitory activity, molecular docking, rational drug design.